Last week I had a couple of friends over for “Christmas” lunch. I made an orange pomegranate prosecco cocktail, Ina Garten’s split pea soup, a salad, and this cake. Isn’t it cheerful? It’s a Cherry Almond Angel Cake and it’s basically a doctored box mix cake. I read about this cake many years ago on a blog I can’t find anymore*. She made the cake based off a Betty Crocker recipe and she made hers in two loaf pans. I wrote down the recipe and all these years later, I finally tried it. It’s so fun. My cherry “glaze” was more of a frosting, but it was really delicious so I’m not complaining. Make sure your oven rack is at the lowest level possible and preheat your oven to 350. In a large bowl, beat cake mix, water, and almond extract on low for 30 seconds. 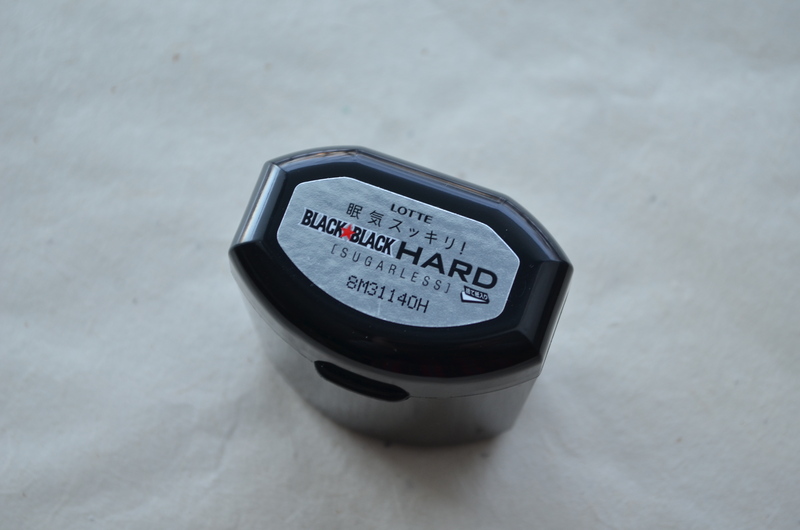 Raise speed to medium and beat for 1 minute. Bake for 37-47 minutes until the top is very dry, cracking, and dark golden brown. If the top is still sticky, the cake is not done. When done, remove from oven and turn over onto a glass bottle. (If you don’t have a glass bottle on hand–this isn’t 1950–you can set your pan on top of 2-3 cans. The important thing is that the cake cools upside down.) Let the cake cool completely. When the cake is cooled, run a knife along the edges of the pan to remove it. Decorate the cake with extra maraschino cherries and beam at your work like a 1950s housewife. Three things: Wouldn’t this cake be so cute for Valentine’s Day? I’m going to make it again for a Valentine karaoke party we’re going to next month. And, if you aren’t a frosting person, I always think angel food cakes are delicious on their own. Maybe slightly less cute, but delicious still. Lastly, if you’re interested, the box mix has instructions for making your angel food in two loaf pans. One for yourself, and one for a gift. *Maybe you’ve read this blog? The woman lived in Champaign, Illinois. She was married, had a corgi, and she made quilts and doilies to show at fairs. She also had an etsy shop where she sold a pattern for aprons made of pillow cases. I love a good consumable souvenir. Whenever I’m traveling, I like to stop into grocery stores to see if there are any locally-made snacks or sweets to take home. (This is how I discovered the deliciousness of Canada’s potato chips!) Finding treats in the grocery store is a lot more budget-friendly than buying them at the airport or souvenir shops, plus there are sometimes hidden gems that aren’t in those souvenir shops. While we were in Missouri, we stopped at WalMart to pick up something. (Full disclosure: We went to pick up a bottle of whiskey–whiskey that was made in Missouri, but not delicious enough to make the cut as a souvenir. Actually it was terrible.) 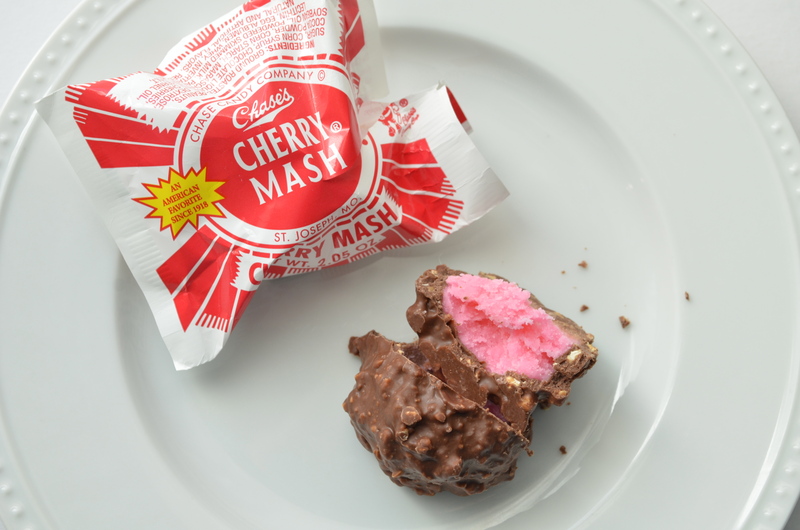 At the check-out I spotted this fantastic vintage candy, Chase’s Cherry Mash. 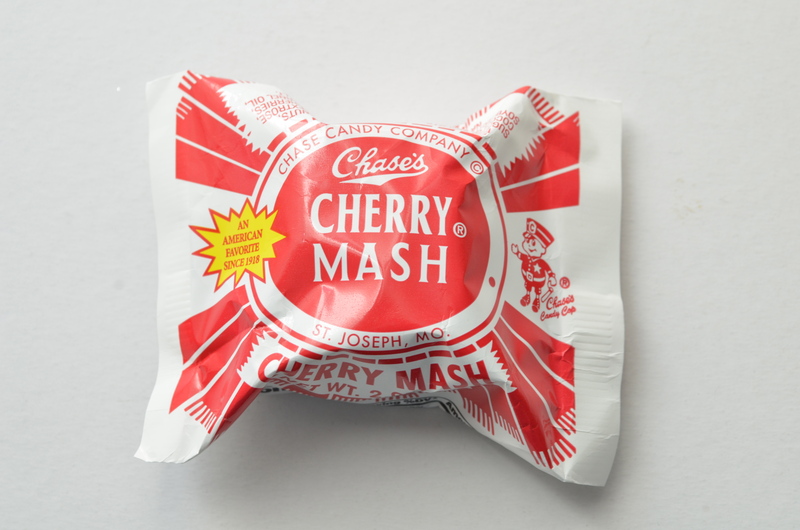 Cherry Mash has been made in St. Joseph, Missouri since 1918. (St. Joseph is about an hour away from Hamilton.) I bought one to try and then went back the next night to buy a few more. The Cherry Mash is made with crushed maraschino cherries, blended into a creamy center and coated with chocolate and chopped peanuts. There are a few videos of the process here. 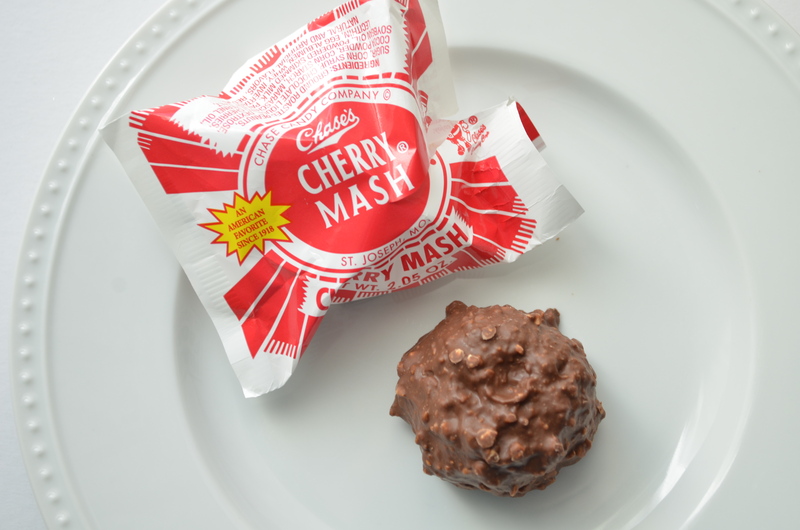 I love maraschino cherries (even the bright red ones that are swimming in red dye) so I think the Cherry Mash is delicious. Because it is so sweet, it’s a shareable portion, but I promise not to judge if you eat the whole thing! I love a good, vintage candy and this one fits the bill perfectly! Today I am on my way to San Francisco to attend Ex Postal Facto! I mentioned before that I will be seeing many of my pen pals while I’m in SanFrancisco this weekend. I’ve met a few in person before at various letter writing and social events, but most of them, I’ve never met. I’m excited to see them and hang out with them…they already feel like old friends. 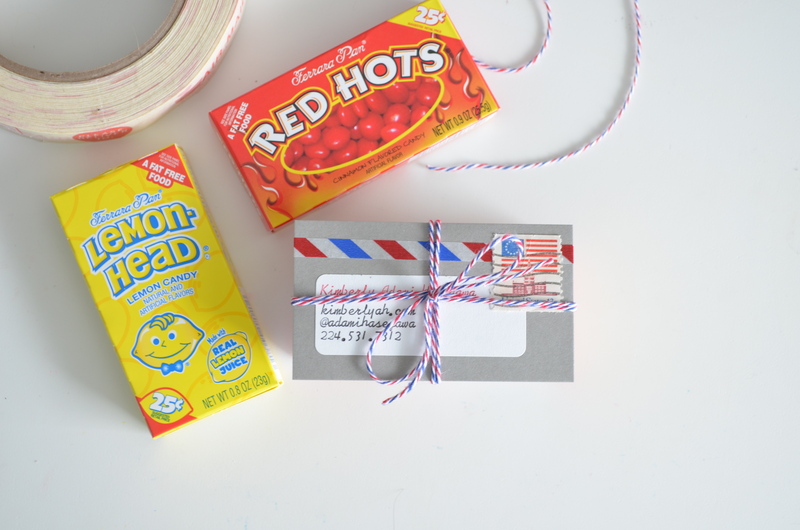 For my pen pals, I decided to make bonus calling cards by including boxes of candy. Ferrara Pan makes their famous Lemonheads, Red Hots, Jaw Breakers, Boston Baked Beans and more right here in Forest Park and they have a fantastic little shop where you can buy fresh candy for practically pennies. I decided to buy Lemonheads (the classics) and Red Hots (my favorites, and perfect for Valentine’s Day) and make up some hometown treats for my friends. I taped the boxes together with some Oh Hello Friend postal-themed masking tape. Then I topped the boxes with a business card and tied everything up with some Airmail Divine Twine to add some more postal pizazz to the package. 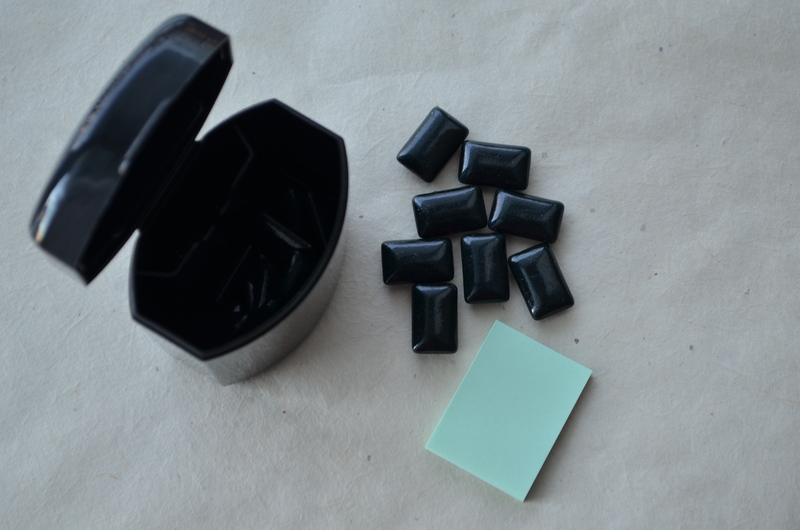 They are super simple and not too bulky and once I hand them all out, I’ll have a little pocket of space in my suitcase to fill up with treats from San Francisco! Yes, Kit Kats are totally an American treat…but man, are they ever better in Japan! On my first trip to Japan, I was browsing some tourist shops in Kyoto and I came across Matcha (green tea) KitKats. I was very intrigued, so I brought some home to try and to give to friends. When I tasted one for the first time, I realized that it was going to by verrrry difficult to part with those tasty green treats! They were so good–sweet, and crispy with just the right amount of green tea punch–and I didn’t know when I’d be back to Japan, so I didn’t want to give them to anyone! I ended up being super strict about giving them away. Is she Matcha KitKat worthy? Guess I’ll eat it myself. 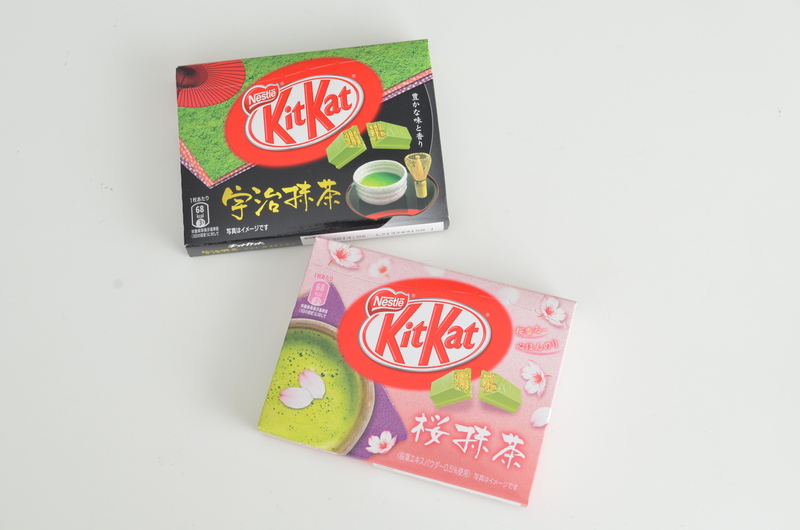 When we traveled to Japan together for the first time in 2011, Naoto and I found Sakura (cherry blossom) Matcha KitKats. They were just as fabulous as the matcha ones–a little bit sweeter with hint of flowery taste complementing the green tea. YUM! I love the fact that they are made for gift giving. 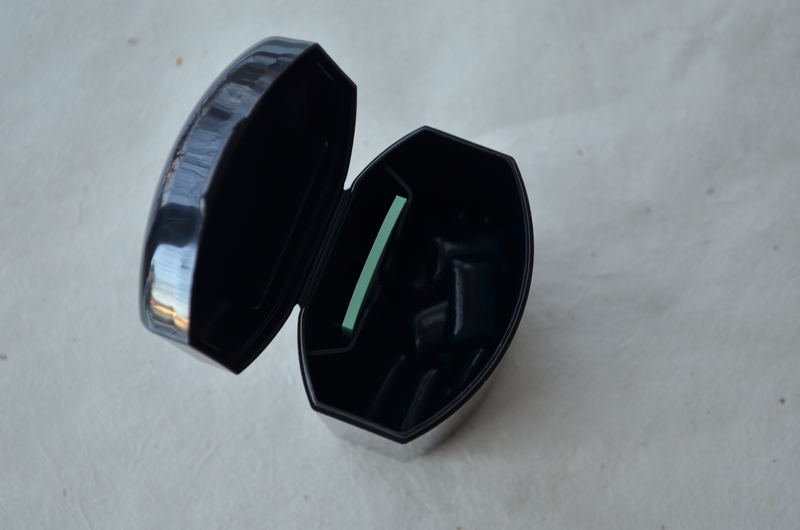 There is a place in the back for you to write a message for your recipient–the perfect omiyage! Inside each box, there are three small, individually wrapped KitKat pairs. 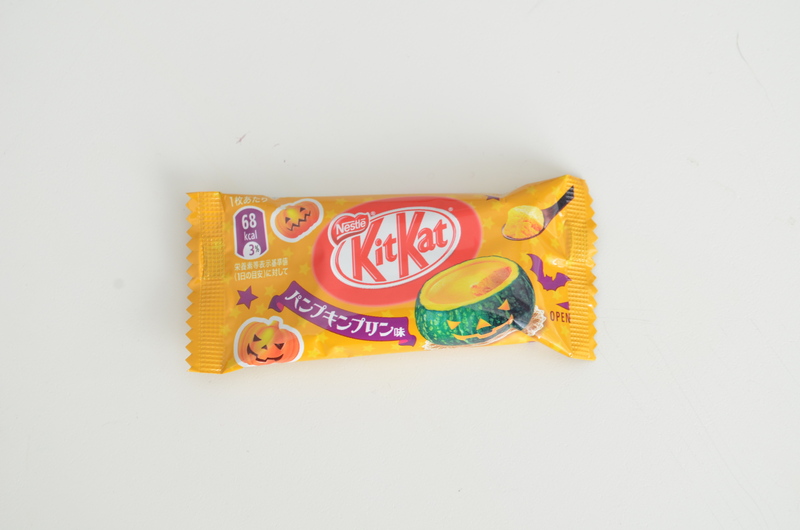 When we were there in September, we picked up some Pumpkin Pudding Halloween KitKats. They were…interesting…not my favorite. It seems that we have a lot more taste testing to do with Japanese KitKats. 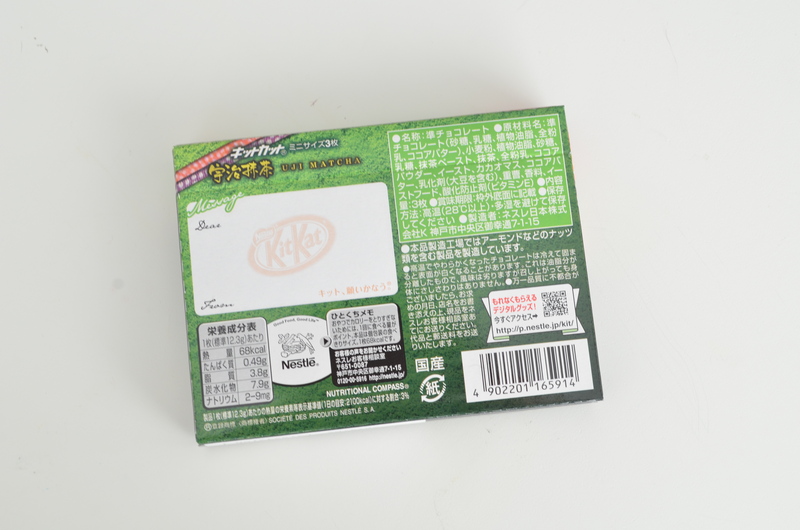 I found this article that reviews a “care package” of crazy flavored Japanese KitKats. Who knew there were so many more? I’ve rarely seen the matcha or sakura flavored KitKats in regular grocery stores in Japan (just at the airport and tourist shops), so I ‘m going to have to do a bit of research and hunting when we go back this year. 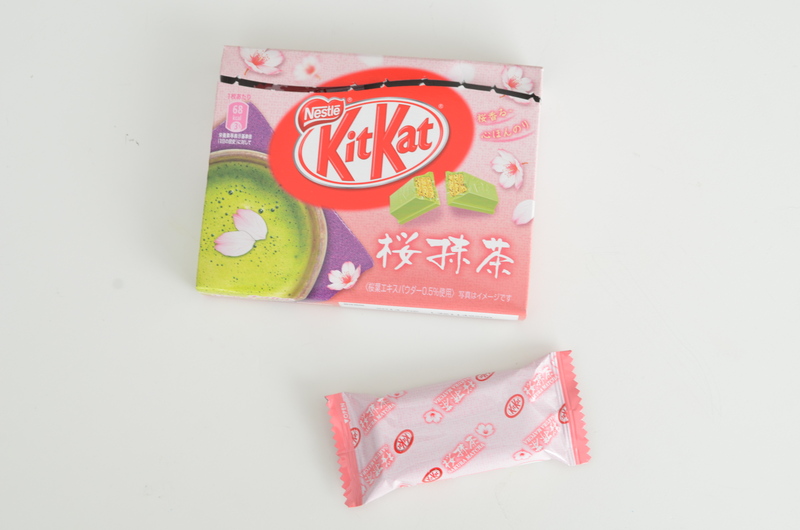 Matcha & Sakura KitKats…yet another reason Japan Does It Better! P.S. For the rest of the JDIB posts, go here! 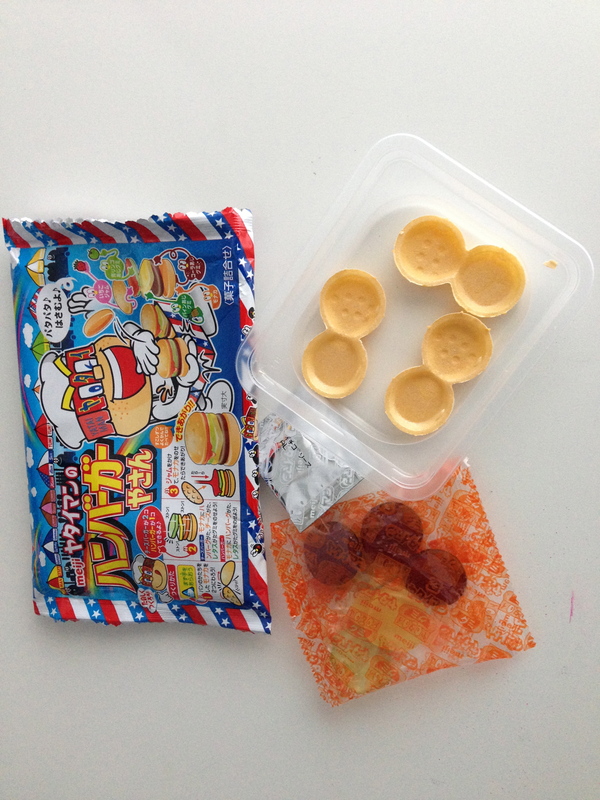 When Hisae sent me this package of Japanese candy, I had no idea that it was so involved. 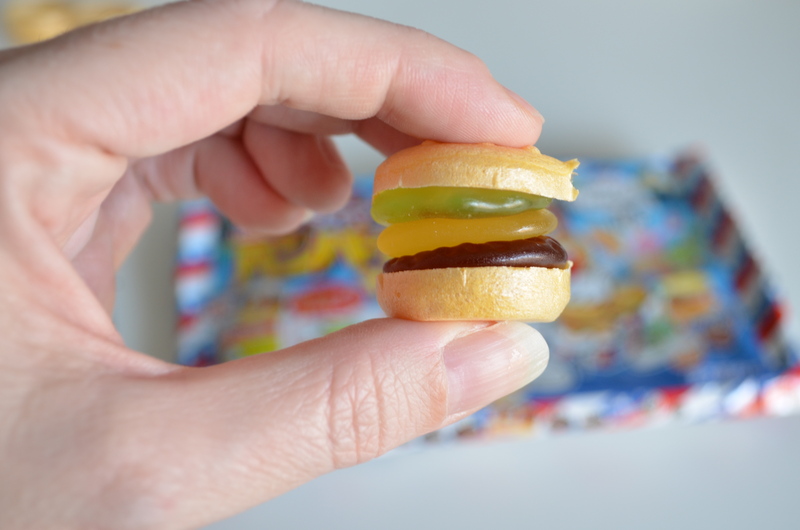 I gathered from the packaging that it was a candy hamburger, so I was expecting something like this. 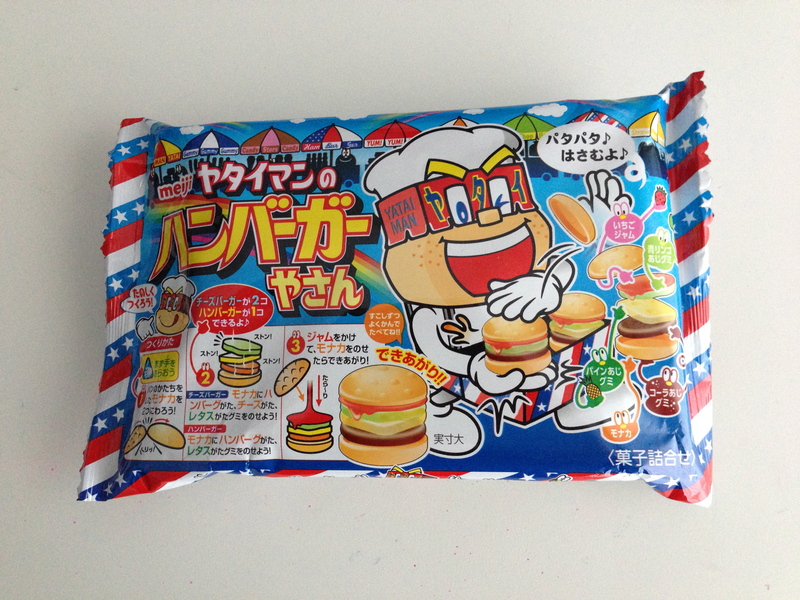 I did not, however, expect the make-your-own cheeseburger that I found inside. 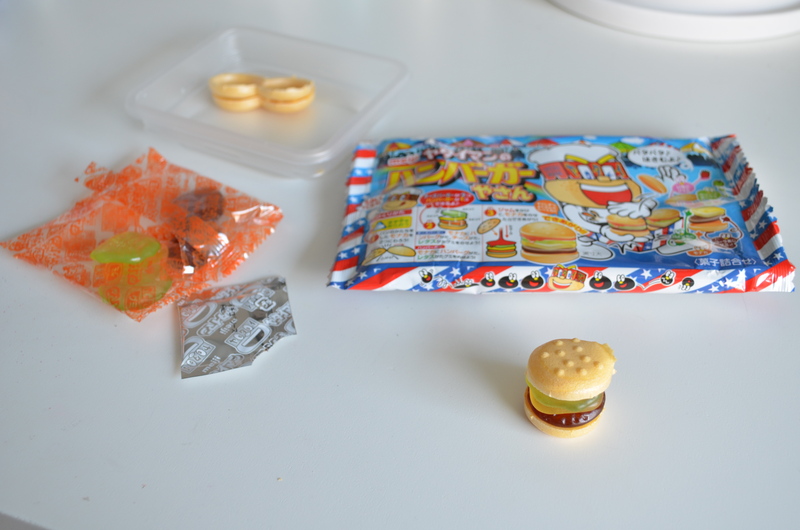 There was a plastic tray of buns, a package of gummy burger patties, lettuce and cheese and a little silver package of ketchup (actually strawberry flavored gel). Ooooh, fun! (Clearly I’m a child.) 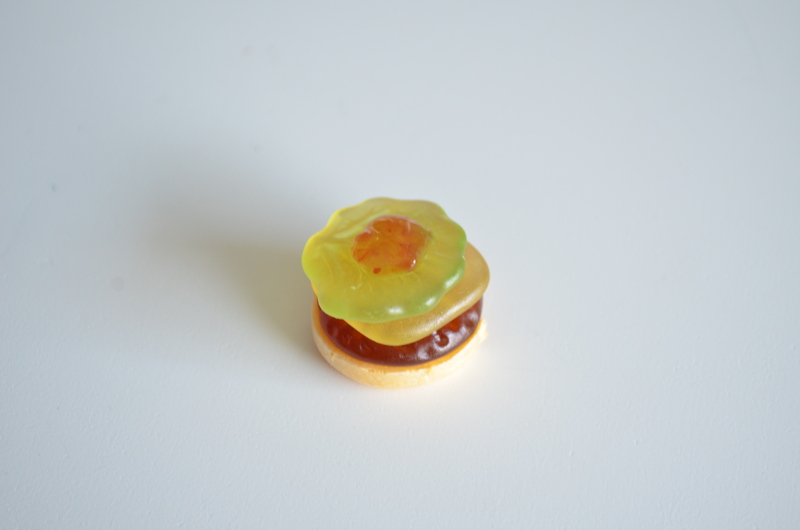 So I cracked apart the bun and added a burger, lettuce and cheese and squeezed on a little bit of ketchup. 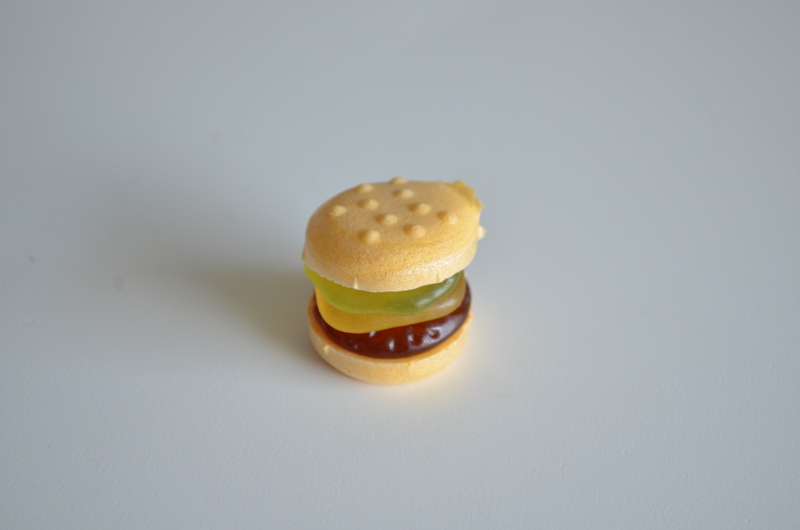 I was expecting the little burger to be all whimsey and no taste, but it was delicious! 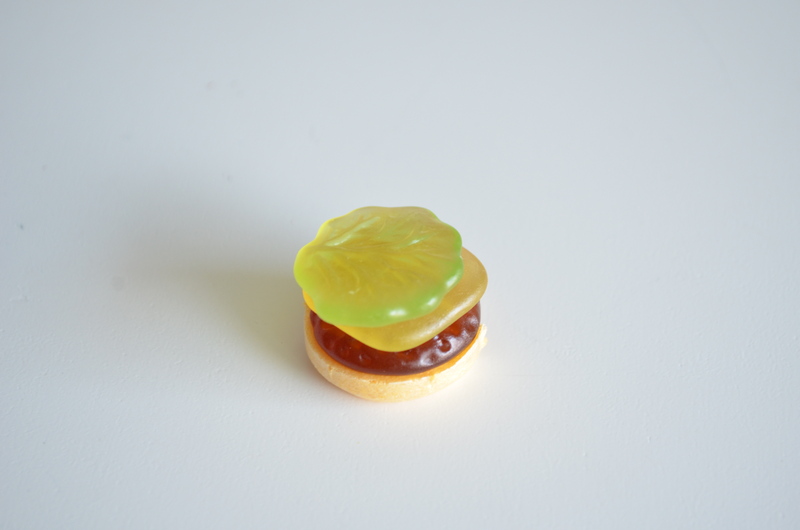 The burger, cheese and lettuce all had different flavors (cola, pineapple and green apple, respectively) and the strawberry gel added some extra sweetness. 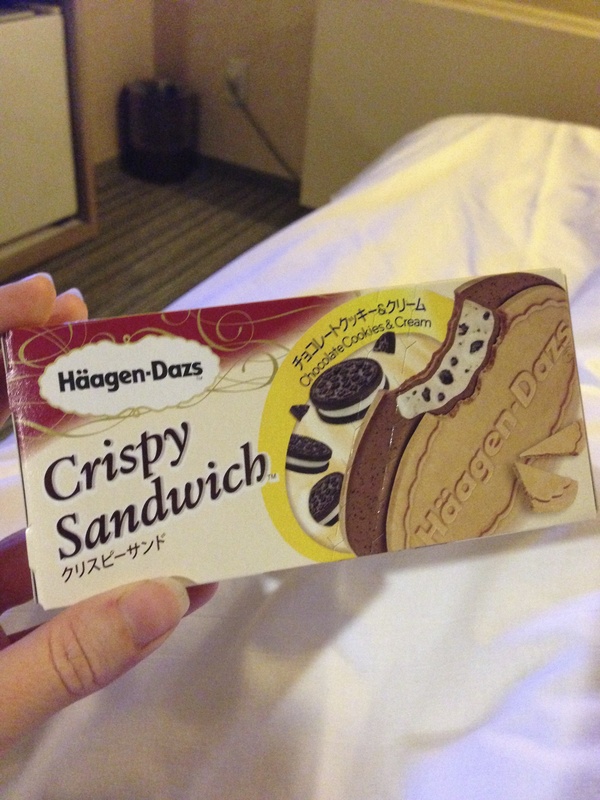 The bun was flavorless and wafer-like, but the crunch was a nice touch.